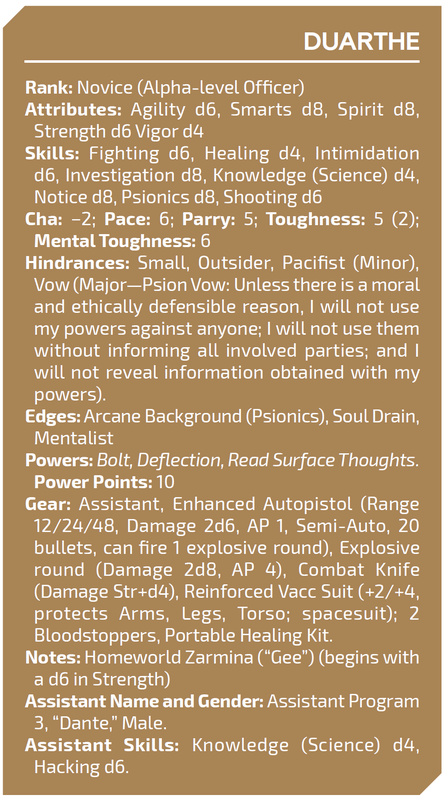 Duarthe: A Psion who refuses to accept who he is. Duarthe was born to a second-generation migrant family in the planet of Zarmina (“Gee”). An only child, he lost his mother at a very early age, and barely remembers her. His father, crewman for a medium freighter transporting supplies and people from Earth to Gee and back, was a distant man, who loved him but was incapable of understanding or emotionally connecting with him. Certainly not with the complex, dark son he had conceived. Because of his father’s frequent trips, Duarthe lived with a distant aunt and uncle who took care of him as a favor to his dad. Duarthe’s father died in an accident in space when Duarthe was nine; a runaway engine created too much heat, the heat sinks in his ship failed and the entire ship blew apart. While Duarthe cried a lot, it was more from the feeling of utter loneliness than out of any deep love for his progenitor. Duarthe was a weak (for Zarmina's high gravity) and quiet kid, who made few friends. His father never had the money to spend on genetic improvements, so he began at a disadvantage. Even so, he grew up a very intelligent boy. He was withdrawn, studious, bookish, lonely, profound and philosophical. He was also weird enough to be the target for bullying and violence from the other kids. The Assistants running on each child’s lenses and on the school grounds detected and reported this, of course, and teachers tried to act against it; but some things change very little, and children only find more sophisticated ways to do what they’ve done for millennia: be cruel to each other. Duarthe got into many fights he didn’t start, and he rarely won them. But he never shied from a fight, and even his bully-torturers had to admit that. Gradually, Duarthe built a hatred for these kids who believed themselves superior to others, better than the rest. He knew he’d get beaten up, but at some point he came to relish the other kids’ cruelty; standing up to them, regardless of the consequences, was his way of telling himself that he would not submit to those who preyed on the weak. Given the nonexistent support he got at home, this twisted pride was all he had. Then, when he was twelve, Duarthe came into the biggest surprise of his life: He tested positive at a routine Psion test at school (he and his family had the psion gene, they all knew that; but it’s not strange to have the gene and test negative. In fact, he was the first tested-positive psion in his family’s generation or the previous one). Most psions are discovered by age eight or nine; twelve is very old for the power to manifest. But manifest it did. And thus Duarthe found himself at twelve, being drafted into the Psion Brotherhood and transferred to Earth. Duarthe arrived, afraid but full of hopes, at the Psion Brotherhood headquarters on Brotherhood Station above Earth, on the Space Elevator. Now he belonged to something! Although he began his basic psionic studies as one of the oldest children, he excelled psionically and academically, even catching the eye of the legendary Ganendra Nathan, Leader of the Psion Brotherhood. Nathan began taking a close interest in the shy, hostile-looking boy from Zarmina. But even here, as a member of one of Humanity’s most powerful organizations, and with a promising future ahead of him, Duarthe felt lonely. He was unable to make friends among his ‘brothers’, and in fact caused antipathy. He began to feel the superiority, even contempt, felt by his fellow students towards non-psions, and these feelings repelled him. He also noticed how low the opinion was of “On-Loans”, the name given to Psions who leave the Brotherhood for a few years to join the Circle, as part of the commitment agreed upon centuries ago by William Donovan, founder of the Circle, and Daniel Michaels, founder of the Brotherhood, respectively. The goal of the On-Loans was to support the activities the Circle performs protecting Humanity; but from the point of view of many psions, working with a bunch of mentally-blind humans must be very frustrating indeed. Even Nathan, one of the most charismatic Brotherhood leaders in memory, very outspoken about the importance of respect between psions and non-psions, felt suspicious to Duarthe. When Duarthe looked at Nathan, he felt the glint of smugness in his eyes, the scent of the schoolyard bully (a very subtle, devious one). Is that all Nathan and the Brotherhood were, just a more sophisticated kind of bully, ready to smack humans down when the time comes? Or was Duarthe imagining things? Further proof of the immense powers and great promise that Duarthe had is that he could shield these thoughts (which would be considered deviant by most teachers in the Brotherhood) from the frequent probe scans all students underwent. But everyone noticed that his antisocial behavior could affect a very promising career. One day, Duarthe and Trevor, one of his schoolmates, went down to Earth on one of their monthly mandatory trips to mingle with non-psions and create emotional connections with them. Unusually, though, while walking down a dark street they were insulted and verbally attacked by a human, a bigot with some personality problems and a dislike towards psions. Brotherhood policy dictated that psions should ignore the prodding and leave, but this human pushed his insults too far and caused Trevor to react, breaking the Psion Vow, mentally attacking the human. In minutes, the whole situation spiraled out of control and Duarthe and Trevor found themselves the target of an attack by a crazed mob of violent non-psions. As he saw Trevor savagely attacked, Duarthe prepared himself to stop these humans and defend himself and his friend (without causing damage, of course), but at the last moment stopped: Was he becoming what he hated most? Who was the bully here, and who was being bullied? Finding himself unable to use his psionic powers on these humans (even harmless powers, like telepathy), feeling more identified with them than with his own kind, Duarthe instead defended himself physically, using his arms and fists, with the expected result that he was soundly beaten down. What he did not expect, however, was that by the time the tussle ended Trevor was dead, lynched by an angry mob that vanished as soon as it realized what it had done. The fight made global news. The humans who instigated the fight were arrested, and Nathan himself went on record in V-World with soothing, conciliatory words about the need for humans and psions to respect one another, and saying that nothing justifies a psion using his powers to harm a non-psion, like Trevor did. But while Nathan was giving his stirring speech, Duarthe, there in the room with hundreds of other psions standing firm in respect, caught his eye. For a brief instant, without needing to read his thoughts, Duarthe knew what Nathan was really thinking: Nathan didn’t really mean what he was saying. In fact, he was immensely angry and disappointed with him. Why had his psions been attacked? Why had Duarthe done nothing about it? The realization hit Duarthe and caused him to reel in surprise. Was this what the Brotherhood was? Had Duarthe become what he hated the most? On the other hand, wasn’t it right to defend a fellow psion who was being attacked? In his paranoia, wasn’t Duarthe taking things too far? The next day, Duarthe registered as an “On-Loan” and prepared to go to the Circle as a Brotherhood representative. When Nathan saw Duarthe’s transfer request, he called him to his office and flat out rejected it with very harsh words. Duarthe sat unmoved and repeated his request. Nathan looked at Duarthe for several seconds, with a hard look in his eyes, and then approved the request without a single word. Less than an hour later, Duarthe had left the Brotherhood, officially on-loan for a few years. He has spent the last few months at the Circle. He, of course, has no close friends, suspected as a spy within his own Circle group. But at least he sees a genuine interest in helping and defending those who need it, an ideal he shares. And, most importantly, here he is not pressured into being superior to anyone. He hopes he can use his powers to improve the lot of humans and psions alike. And he fears what will happen the next time he meets Nathan, or when his “On-Loan” status ends and he is forced to return to the Brotherhood. Duarthe is twenty-two years old, but looks older than he is. He is a small but strong man who always looks disheveled, as if he has had a bad night’s sleep. His dark hair is long and he does not apply shaving biocream frequently so he usually has a few-days’ beard. He always wears official Circle vacc suit uniforms, which are usually rumpled and sometimes sealed incorrectly. He avoids wearing the light-blue sash expected of psions who are not wearing the Psion Brotherhood uniforms, but always wears the requisite Psion Brotherhood Logo pin (two open hands) to make sure no one mistakes the fact that he is a psion. He spends a lot of time by himself, reading books using his sensor glasses. Even though his disheveled appearance may bring attention to him, his behavior is as low-key as possible, and to most people he looks as a non-important member of the team, or an underling. Until they see the pin. He is usually quiet, except around his friends. It takes a long time for him to consider someone a friend. Duarthe’s assistant, Dante, is as peculiar as Duarthe himself. Dante has no typical visual manifestation, by Duarthe’s own choice. He only has a disembodied voice, and appears like a floating black point. Duarthe requested his assistant to be reserved and obedient. Dante, however, is slightly rebellious and more than once has questioned or contradicted his owner. Assistant personalities have a random deviation component by design, but it is to be assumed that Duarthe secretly likes Dante’s quirks, otherwise he’d have them changed. Seven Worlds Designer Diary: The Campaign is Epic!